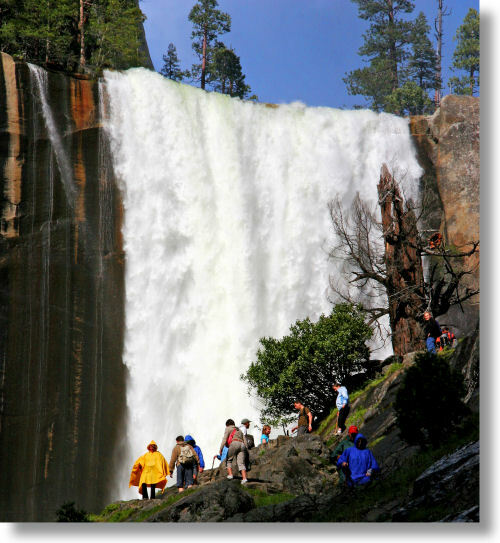 Vernal Fall is the first of the waterfalls along Yosemite's spectacular Mist Trail. The Mist Trail is best in the spring, when snowmelt transforms the cliffs into walls of water. The hikers in this photo are nearing the final approach to Vernal Fall, a section of trail carved out of the rock in the canyon wall - and a part of the hike where they'll learn just how appropriate the term "Mist Trail" is. It's no coincidence that so many of the trekkers on their way back down are wearing rain gear. The Mist Trail starts from the east end of Yosemite Valley.